LULU is a small black female who is happy and joyful to be around. She sometimes appears a little bit timid but with patience and being given new experiences, her self confidence will grow. She gets on well with her kennelmate and is happy to walk alongside him too whilst on her walks. She gets very excited when she knows she is going outdoors and is a bit strong to start with but she settles well and enjoys her sniffs and surroundings. She loves people and attention too with cuddles and ear scratches coming top of her list. She needs some housetraining but this could be done easily with a regular toilet routine as she settles into her new home. 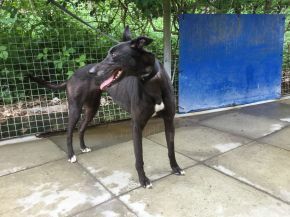 She is a lovely girl and will bring a lot of joy and fun into her new home.